Have you ever walked by those unknown fruits in the market and wondered why and how to use them? Not long ago I ran across starfruit on a morning buffet at our resort and thought let’s give this a shot — kind of grape-like flavor and citrusy, difficult to explain. However, starfruit has a decent amount of fiber and vitamin C. Everything we crave right now in the midst of winter. I figured this star-powered fruit could be equally amazing dried, with a bit of ginger and chocolate. 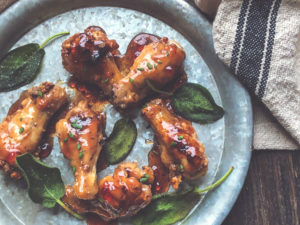 Not to divulge my age but while developing this recipe all I could think about was Gilligans Island of all things. Do you remember Ginger, the star stranded on an island with the boys all falling at her feet? Hello, Gorgeous seemed fitting for this melt in your mouth exotic treat. If I were stranded on an island, I would want a stash of these. Hello, Gorgeous seemed fitting for this melt in your mouth exotic treat. If I were stranded on an island, I would want a stash of these. 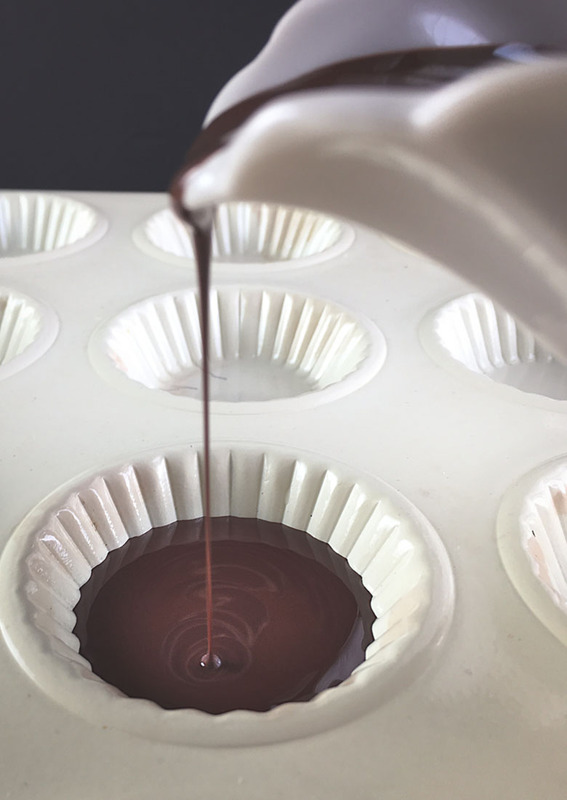 Pour melted chocolate into a silicone mold or candy mold tray. 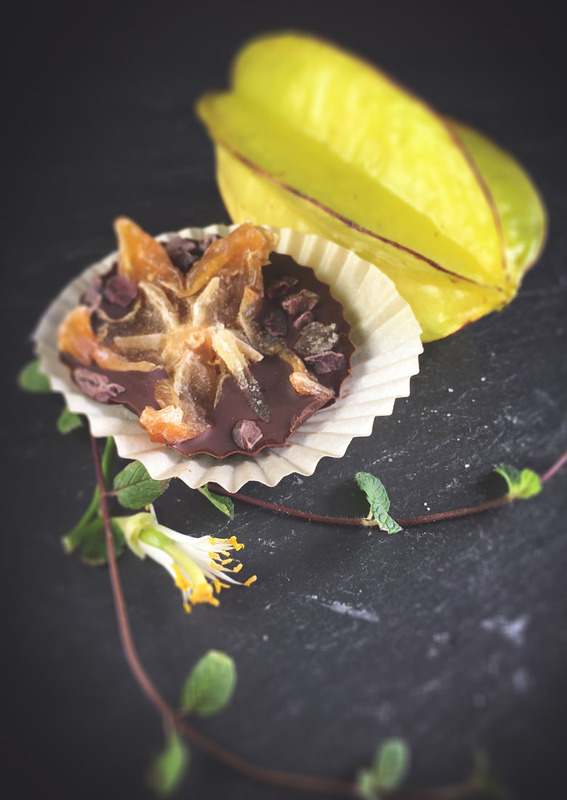 Place each star fruit into your chocolate. 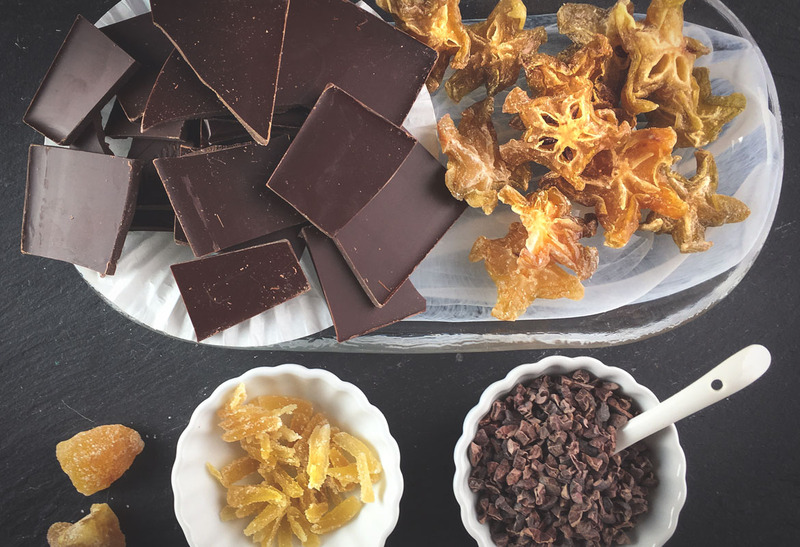 Sprinkle cacao nibs over top, and press in the candied ginger slivers into the chocolate. Pop out each mold by gently pressing on the bottom of each in an upward motion. Enjoy a sweet chewy treat with spiced notes of ginger. 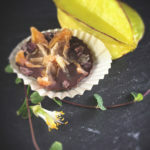 The crunchy cacao nibs contrast well with the star fruit. Star fruit is high in fiber and vitamin C. Anti-cancer and anti-inflammatory fruit that heals the body by neutralizing free radicals. Cacao nibs are even better for you than dark chocolate. Say what? You can benefit more from eating the beans themselves with less processing. This mood improver can trigger emotions like euphoria. Woo-hoo! Crystallized ginger can reduce inflammation and relieve pain and is often used to treat nausea.